Review posted December 26, 2015. Katherine Tegen Books (HarperCollins), 2015. 291 pages. Lady Truthful Newington is eighteen years old and soon to be launched into fashionable society in London. 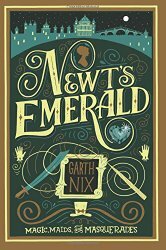 But on her birthday, her father gets out the famous Newington Emeralds, which she will inherit when she turns twenty-five, and a storm comes up and they are stolen. Her father lapses into illness after the loss, blaming her cousins, the Newington-Lacys. Truthful knows they wouldn't have done such a thing, but she can hardly investigate herself as a young female. However, when you have an aunt skilled with glamours, it's possible to disguise yourself as a young male relative, who would of course be authorized to search for the emeralds. Along the way in the search, she encounters a young man also on the trail of the thief. He is not happy when he learns she is not who she appears to be. This book doesn't have a complicated plot or romance. The magic is mostly light-hearted and about the appearances of things. But it's definitely a fun story. If you like Regency romances (and who doesn't enjoy one now and then? ), the magic in this one adds some extra spice. In London, Truthful felt sure she would be considered plain, particularly as her sorcerous talents did not include any particular skill with the glamours that would enhance her charms. Truthful had the small weather magic that ran in her family; she could raise a gentle breeze, or soothe a drizzle. In addition to this, horses and other animals liked her and would do her bidding. But she had none of the greater arts, and little formal training. Truthful's time in London ends up being much more interesting than merely balls, including peril on land and sea. But you can't have a Regency Romance without balls, and this book is no exception.